The Fun Bible Facts page lists the most compelling evidences that reveal the Bible is perfectly organized, structured, and numbered in many mays--all intersecting in a perfect DNA like pattern. Even upon examining these major facts you might be tempted to think they are simply interesting coincidences of scripture. I've found that it is the preponderance of evidence that brings one slowly over to seeing the patterns of perfection are real. This page gives many less compelling evidences for the Bible's numeric perfection in smaller pieces, but ones that are amazing just the same. Don't worry if you think the premise of the Numeric Map cannot be possible. Everyone, including myself, begins here. We just cannot comprehend in our human thinking that God works this way. Other's of us know too much about the Bible's history to believe God insured every number in and out of the text perfect. And others "know" about too many discrepancies in the Bible to declare it perfect. I understand, all these things are what history says but...we can't dismiss what the perfection of numbers tell us and to see the patterns each of us needs to seek enough evidences to realize what God has done. 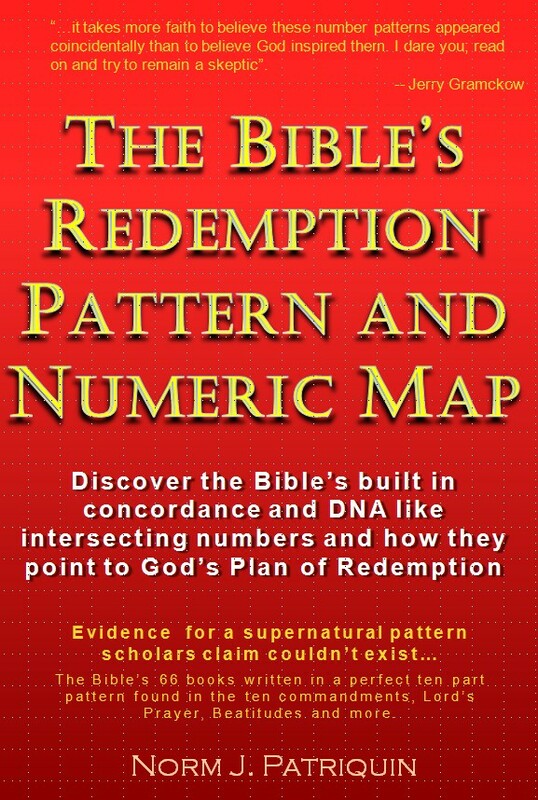 How many of these evidences will your mind need to begin to push it from skepticism to possibility and eventually to belief of the reality of God's Numeric Map and Redemption Pattern? Numeric Map numbers for Exodus 25:18 are strong clues to Jesus on the Mercy Seat - The Numbers 22 and 14 found associated with Exodus 25:18 are strong clues associating the cherubim with Jesus and the Mercy Seat - The Mercy Seat sits above the Ark of the Covenant and is where Christ will one day rule from. There are lots of questions about this seat and new details helping us understand it are valuable. A significant clue about its nature is found in the verse at Exodus 25:18 which tells of the cherubim found on each side of the Mercy Seat -- -- "You shall make two cherubim of gold, make them of hammered work at the two ends of the mercy seat. This is the 2214th Bible verse which is a number made up of two of the most common numbers associated with Jesus; #22 (<-see link) for Jesus the suffering servant; and #14 (<-see link) for Jesus the King and Savior of the World. Coincidence? Not likely, but it is also not clear what the full meaning of this association is. For those who study such things, the Bible's numeric map provides clues we've never had before about this special place. It seems certain these numbers associate Jesus with this throne the messiah will one day rule from. 38 or 40 years wilderness wandering? --We often hear of the 40 years Israel spent in the wilderness but you may have also heard the number was actually 38 years. Which is correct? It was 40 years from exiting Egypt the promised land was entered but there were two years before the actual wandering began. These were two years of preparation and traveling to the promised land for the first time. When Israel was too afraid to enter, God caused them to wander for another 38 years. Acts 13:18 points out both these numbers. The reference to "about 40 years" speaks to the 38 years and this appears to be confirmed by the chapter and verse reference containing the number 38. -- Act 13:18 "For a period of about forty years He put up with them in the wilderness. After about an hour had passed -- I always have to wonder if this is a reference to 59 minutes because this is verse 59 in the Bible's 995th chapter (59 and 95 are related numbers). 59 is about picking up or cross and not turning from God, even in tough times. Sixty, the next number is about judgment and wrath to those who turn from God. 59 speaks of knowing that blessings or judgment are coming and persevering in times of hardship. Verse number 59 and the allusion to it in the text warn us that our God is a jealous God, not afraid to punish those who fall away. -- Luke 22:59 After about an hour had passed, another man began to insist, saying, "Certainly this man also was with Him, for he is a Galilean too." "About 5000" witnessed the miracles and believed - Four different verses refer to there being "about 5000" people present to see the miracles of Jesus and believe in his name. One of these is in John 6:10 which says "Jesus said, "Have the people sit down." Now there was much grass in the place. So the men sat down, in number about five thousand." (see also Matt 14:21, Luke 9:14, Act 4:4). One day it occurred to me to look at the 5000th verse of the Bible to see of the text might be telling us this is about the number 5000 or the 5000th verse. I was amazed the see the perfect fit. Since I'm convinced of the Bible's perfection beyond comprehension, I believe this is by design. You decide for yourself if the phrase used in the text "about 5000" might refer to this 5000th verse of the Bible -- Deu 3:24 'O Lord GOD, You have begun to show Your servant Your greatness and Your strong hand; for what god is there in heaven or on earth who can do such works and mighty acts as Yours? God's numbers are not just interesting, they are a built in concordance to the Bible. Genesis 8-The phrase "After 7 days" is a reference to the 8th day - Number 8 is about New Covenants and new beginnings and this 8th chapter of Genesis is about the new beginning for Noah and the remnant of 8 people that were saved through the flood. In Genesis 8:8 Noah sent out a Dove to see if it could find rest, but it did not. He would send it out again. This example of the numeric map shows how God likes to slightly hide his miracles in the scriptures--so we need to be watching for unusual phrases associated to numbers that key us in to special meanings. In Genesis 8:10 we are told "So he waited yet another seven days; and again he sent out the dove from the ark". This time the dove came back with a branch that indicated the flood was receding and they were saved. In the 8th chapter of the Bible, the remnant of 8 found they were saved when they had waited again until the 8th day to send out the Dove. By the way, the Dove is an indication of the Spirit of God which is also associated with number 8. It was in verse 18 the water was finally abated and scripture says -- "So Noah went out, and his sons and his wife and his sons' wives with him.". All these examples help us see that the 8th chapter of the Bible is about the new beginnings given us by God. Judges 6:11 is the 6,666th Bible verse - Beating out wheat in order to save it -- Number six in the Redemption Pattern is about sin and redemption from sin and in this 6,666th verse we find Gideon beating out wheat (threshing) in order to save it from the enemy. In God's process of redeeming us we get beaten out in order to be saved. This 6,666th verse has a reference of 6:11 and 6x11 is 66; This verse is in the 217th chapter which in gematria can be seen as 26 (2 & 7-1 = 26) or 66; and is the 156th verse of Judges and 156 can be seen as 66 ((1+5) & 6 = 66). A verse of intersecting numbers and text - All the major references point to number 66 and 6,666 - Judges 6:11 Then the angel of the LORD came and sat under the oak...as his son Gideon was beating out wheat in the wine press in order to save it from the Midianites. Matt 3:7 But when he saw many of the Pharisees... "You brood of vipers, who warned you to flee from the wrath to come? Luke 3:7 So he began saying to the crowds... "You brood of vipers, who warned you to flee from the wrath to come? Matt 4:4 ..."It is written, 'MAN SHALL NOT LIVE ON BREAD ALONE, BUT ON EVERY WORD...' "
Luke 4:4 ..."It is written, 'MAN SHALL NOT LIVE ON BREAD ALONE.' "
Lam 4:4 ...The little ones ask for bread, But no one breaks it for them. Mrk 1:8 "... but He will baptize you with the Holy Spirit." Act 1:8 but you will receive power when the Holy Spirit ..."
2 Thessalonians 2--A chapter about the Day of the Lord full of references to #99 which is about this day (Matthew 24:42)--Verse 2:4 in this chapter is the verse of prophecy that tells us of the event that initiates the return of the Lord (2:4 = 24) "who opposes and exalts himself above every so-called god...he takes his seat in the temple of God, displaying himself as being God". This verse about great sin is the 29,666th verse (666) and is in an 18 (3x6) related chapter. Also a #18 verse is Revelation 13:18 is the verse telling of the number of the beast which is 666 - "Here is wisdom. Let him who has understanding calculate the number of the beast, for the number is that of a man; and his number is six hundred and sixty-six". Like the 18 and 99 related 2 Thessalonians chapter 2, Revelation chapter 13 is the Bible's 1180th chapter and this is the 229th (29) verse. It's cross bible verse number is 30,927 in which we can see the number 39 (999) and 27 (3x9). So we see the number 666 strongly related to the number 99 and 999 as well as their associated numbers. Back to 2nd Thessalonians 2:4 -- some of the special numbers associated with this chapter are: (1) This is the 1118th chapter relating it to #18 which is another way of expressing #99 (2x9 or 9+9). (2) It is the 189th chapter of the New Testament and 189 can in many ways represent #99. (3) This chapter has verses with cross Bible verse numbers from 29,663-29,679 which places it in the 29,000 series of Bible sections. (4) The last verse of the chapter is also the 29th verse of 2 Thessalonians.